There may be an ashtray in the front centre console and in the rear door trim. 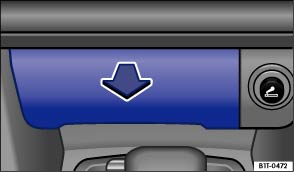 To open, pull the ashtray to the rear in the direction of the arrow . To close, push the ashtray forwards as far as it will go. Lift up the ashtray insert to remove it. Place the insert back into the ashtray from above once it has been emptied.